As has been the case in previous years the team at Bachmann have provided the media, and Bachamnn Collectors Club members, with a mid-term update on work in progress across all the many stages of the manufacturing process from: research, Drawing office CAD, Tool room, Engineering Prototypes samples, livery artwork, production and being shipped. This post is a quick summary of the status of those models of a Southern Railway / British Railways Southern Region flavour. Although some items have been a long time coming, what can be seen is that catch up / progress is being made. Click on the linked text to get more information on the details of each item from my post on the original announcement. The EP1 of the 2HAP EMU. Picture copyright and courtesy of Bachmann. The long-awaited ex LBSC H2 Class 4-4-2 Atlantic is very imminent, being released in two versions No. 2421 ‘South Foreland’ SR Olive Green and No. 32424 ‘Beachy Head’ BR Black Early livery. I have been fortunate to have a review sample in my possession and will be posting a review in the next week or so, watch this space. Being produced alongside the H2 Class is the earlier H1 Class version initially as No. 39 ‘La France’ in LBSCR livery, which is also being shipped. Within the drawing room are the many permutations, 5 types, of the Bulleid coaches along with the 4BEP (Class 410) EMU. The 2HAP (Class 414) EMU is at the first Engineering Prototype (EP1) stage and as from the accompanying pictures is looking the part. Three livery versions will initially be released being: BR green livery, BR blue & grey livery and Network South East livery. At the second Engineering Prototype stage is the 158/159 DMU with with the 3 car 159 Class to be released as No. 159013 in Network South East livery. Recently shipped have been the four versions of the Bulleid coaches in BR(s) malachite green that together, BTK – TK – CK- BTK, create four coach set s84. The lovely ex SECR Birdcage coaches, already released in 00, scaled down for N gauge and being released in SECR Wellington Brown, Southern Railway Olive Green and BR Crimson liveries are now approved for production. The Class 450 and Class 319 EMUs are in the drawing office, whilst the 3 versions of the ex SECR C Class 0-6-0 as No. 271 SECR plain green livery, No. 1256 Southern Railway Black livery and No. 31227 in BR Black livery with early emblem along with the Class 170 2 Car DMU No. in 170308 in South West Trains livery are at the artwork approval stage. I hope you find this round up interesting and as stated above watch this space for a forthcoming review of the ex LBSC H2 Class 4-4-2 Atlantic. Today Bachmann Europe Plc. announced their plans for the next 18 months, or so for both the Bachmann Branchlines (00) and Graham Farish (N) brands. They also provided updates on the current work in progress. I outline below the items of Southern / Southern Region interest. The full details of the Bachmann and Graham Farish ranges can be found on their website here. The headline new tooling for Southern Railway and Southern Region modellers is the much requested Bulleid 64ft coaches. The original Bulleid 64ft coaching produced by Bachamnn are now a bit long in the tooth and these completely new toolled versions will be most welcome especially as the range will incorporate both the SR and later BR(s) built versions with both 10″ and 15″ window vents and also the later bodyside strengthening rib within tooling options. Five body toolings will include: Semi Open Brake Third (BTK), Corridor Composite (CK), Brake Composite (BCK), Corridor Third (TK) and Open Third (T). Five H1 Class locomotives were built for the London, Brighton and South Coast Railway by Kitson & Co. between December 1905 and February 1906 to the design of D.E.Marsh. The first was withdrawn in January 1944 and the last in July 1951. This is new tooling specific to the H1 Class. 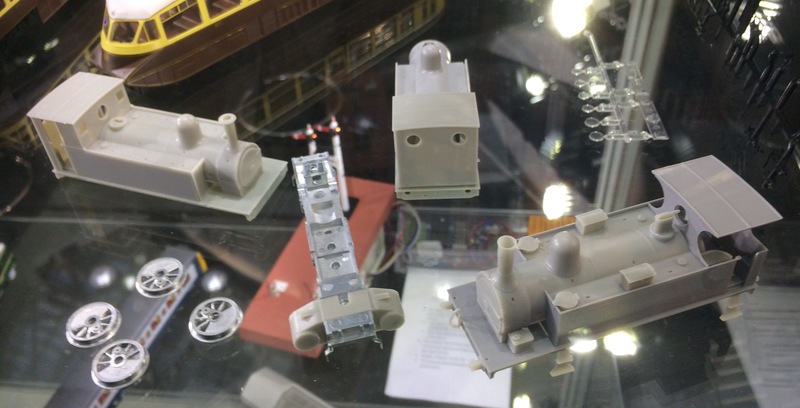 Differences from the H2 Class currently in production include the curved running plate, early cab and boiler fittings. It has been developed alongside the H2 and will available for delivery later this year. Initially only the LBSC livery is being released but others will be in the pipeline for future years. 9 x two-car and 6 x four-car units were built between 2003 and 2005 for Porterbrook Leasing Company for use on Southern’s Uckfield branch which is not electrified. This model is based on new tooling also being developed for the Class 170 DMU. 22 x three-car units were originally built as Class 158 units by British Rail Engineering Ltd in 1992 for Regional Railways, by the time construction had been completed they were no longer required. Rosyth Dockyard converted them in 1992 and 1993 to a new specification for the Network SouthEast sector of British Rail. These units were to replace locomotive hauled trains on the London Waterloo – Salisbury – Exeter route. All saw service post privatisation with South West Trains and more recently with South Western Railway (since 20th August 2017). Southern steam modellers in N Gauge get revised tooling for the N class model that has seen revisions to the tender tooling to provide a Next 18 DCC decoder socket and space for Digital Sound to be fitted. This year sees the much requested southern livery fitted with smoke deflectors for the first time. The Class 450 is a member of the Siemens Desiro family for which Graham Farish already produce the Class 350 variants. The Class 450 EMUs were built by Siemens for South West Trains. A total of 127 four-car units are currently in traffic on South Western Railway long distance routes in and out of London Waterloo (since 20th August 2017). From a work in progress perspective, in 00: the ex LBSC 4-4-2 H2 Class ‘Atlantics’ and the newly announced H1 are now at the artwork / livery samples stage. As reported from Warley the the 45 ton Ransomes and Rapier steam crane is now at the Engineering prototype stage. and both should along with the H1 be delivered during 2018. The Class 159 DMU is already in the tool room, whilst the Class 414 2HAP and 4 BEP are still in the drawing office. Note: for both brands and scales I have not relisted above those items already announced last year as per their announcement here. Bachmann first announced the introduction of these ex South Eastern and Chatham Railway 60ft Birdcage coaches back in March 2013. Has it been worth the wait? Although at the time of writing only the BR Crimson versions are due this month, I have to say, yes very much so. The review is is a version of one I have written for British Railway Modelling magazine the electronic version of which is published today with printed copies to be available next week. These 60ft three coach ‘birdcage’ sets were introduced by the South Eastern and Chatham Railway (SE&CR) between 1912 and 1915; and comprising of 62 sets were the most numerous sets compared to the previous 50ft examples. With the birdcage lookouts over each of the guards compartments these sets typify the standard SE&CR non-corridor coaching stock. The sets comprised originally of: 2nd / 3rd class composite Brake Lavatory (later declassified to Brake Lavatory Third (SR Diagram 162), a 1st / 2nd (later declassified to 1st / 3rd) Lavatory Composite (SR Diagram 315/6) and the Brake Third (SR Diagram 160), The Composites were built in batches with two distinct body side variations, with the initial batch having two wide windows on each side for the saloon, whilst the later batch had one wide and one narrow window for the saloon; Bachmann have tooled for both versions. The Southern Railway renumbered both the individual coach and set numbers between 1923 and 1929. The SR versions are due to follow in October / November with the SE&CR versions November / December. Separately applied fittings include the roof vents, vacuum pipes, handrails and grab handles. The brake ends also have separately applied lamp irons and brake control apparatus. The glazing is commendably flush and the window corner radii, especially in the drop lights are very nicely prototypically small. A representation of the internal window bars is included on the luggage compartment door window glazing. The moulded interior and painted seating, and also showing the position of the body fixing clips. The body is removed via easing the four clips located on each side to reveal a moulded interior with partitions, table in the saloon and even lavatories (where appropriate) and the seating painted in respective colours. The underframe detailing is exquisite with finely mounded brake details, 4 sets of very finely moulded queen post truss rodding and even the turnbuckles. The buffers are separate moulded items and not sprung. Dynamos and battery boxes are fitted only to the the SE&CR composite, and on the SR / BR versions the Composite and the Brake Third as the electric lighting was through cabled to the other coaches in the set. The separately fitted items and finely moulded 8ft Heavy Fox bogies can clearly be seen. The all new well detailed 8ft Heavy Fox coil spring bolster bogies fitted with metal wheels sets and pin point axles running in metal bearings are very freewheeling. Detachable couplings in NEM pockets are mounted on the now standard close coupling mechanism. The resulting gap (4mm on the straight) between coaches could still benefit from being reduced slightly with perhaps an alternative to the supplied tension lock coupling (I test fitted Kadee No.18s, although of course the prototypes were not buckeye fitted, and this reduced the gap to 2mm) if your minimum radii allows. The coaches when test ran, run very smoothly both hauled and propelled though a complex range of pointwork. No internal lighting is fitted but each bogie includes wiper pickups so this might be a potential option in the future. Depending on the lighting that the coaches are viewed under the rendition of the crimson livery might appear to some to be slightly on the dark side, although it does match previous ready to crimson releases in that respect. The initial SE&CR Dark Lake livery sample as previously shown by Bachmann has been commented on as being too brown and Bachmann I believe are currently looking at revising this to give a deeper red colour. Please note: all the images on this post are copyright and courtesy of A York and BRM Magazine. Bachmann have been given assistance in the research and preparation of these excellent models by friend Trevor Rapley the owner of, albeit one of the earlier 50ft version, birdcage Brake lavatory Composites preserved on the Bluebell Railway and the results speak for themselves (although I am sure someone will moan cryptically due to finding maybe a rivet slightly in the wrong place). The introduction of these sets with their distinct character, being of pre-grouping origin, that were long lived and little modified during their lifetime; along with recent and planned (check back on here after midday on Monday 11th for a further announcement) South Eastern & Chatham Railway / Eastern Section Southern Railway locomotives; will ensure that these excellent coaches prove popular. Well the annual event that is the Warley National Model Railway show at the NEC has now been and gone and by all accounts it appears that it was a good show, not that I was able to see as much of it as I might have liked. I had a good weekend on the Hornby Magazine stand operating friend and Editor Mike Wild’s latest layout Grosvenor Square, despite it being Western Region and DCC, but I think I just about coped. I apologise to anyone whom overheard and didn’t like my complaints (usually timed to gained maximum effect depending on whom was in earshot…especially that nice Mr Pete Waterman on the stand opposite…) that all Western region locomotives look the same, it was in jest… honest! As is becoming more usual now a number of suppliers and manufacturers time announcements, product development updates and availability of new product around the time of / during the show and this year was no exception. This post attempts to round up some of those items of interest seen at the show from a Southern perspective, although this was slightly more limited than it has been in the past. Like last year, Hornby used the Warley show to give a presentation on some of their plans for 2017 and make some new product announcements, including a Hitachi IEP Bi-Mode Class 800/0, which can be found via their website on their Engine Shed Blog. The full 2017 range including all the liveries variations from existing rather than new tooling is planned to be launched in January 2017. R3538 number 308 SECR lined green. No.308 was built at Ashford Works in June 1906, entering traffic at Slades Green and was repainted to Maunsell Dark Green in 1925, when also renumbered as A308. Moving to Gillingham in July 1931, her last shed was Tunbridge Wells West, from where she was withdrawn in December 1962. R3539 number 31518 BR late crest (with Overhead Electric warning flashes) lined black and pull push fitted. No. 31518 was built in July 1909 at Ashford and entered traffic at Orpington, numbered 518, Being dual braked, 518 mainly worked Chatham section trains. In December 1923 she became A518, then 1518 in July 1931. Post Nationalisation she was renumbered 31518 and later pull push fitted in March 1952, Withdrawal took place from Three Bridges shed in January 1964. R3549 number 1324 SR Maunsell Olive Green. No.1324 was built at Ashford Works in May 1907, entering traffic as No.324 at Ashford. In 1924, based Tonbridge, she often operated services between the Eastern and Central sections of the Southern Railway. Renumbered as No.31324 under British Railways, withdrawal from Three Bridges shed occurred in July 1962. It therefore appears that the previously advised release of the BR early emblem version will not materialise as part of the first releases. The running samples of the new original style Bulleid Merchant Navy pacifics were on display, the malachite green versions of 21c1 and 21C3 can be seen left, and they represent the condition that these locomotives first ran between introduction in 1941 and early 1943. Look out for a post likely to be published next week detailing the exact condition and dates applicable to all these four versions which I hope will assist those wishing to purchase the correct version for their time period or those potentially wanting to renumber to other members of the class. It is still hoped that further livery versions, perhaps the inverse of the above, will be part of the 2017 range, although it should not be beyond the skills of many to re-livery the diagram 1529 version to the SR period. Following on the recent announcement of their intention to produce 00 bullhead plain track with a more prototypical sleep spacing (bearing in mind that 00 being 16.5mm gauge rather the prototypical 18.83 it is still a compromise that the majority of us modellers accept) Peco also had on display an early mock up / EP of a large radius turnout which certainly looked good. It is my understanding that the geometry will match their existing code 75 streamline turnouts. No new announcements from Bachmann, as is often the case at Warley, as their 2017 range is planned to be announced on January 8th next year, slightly earlier than their usual March date. 31-921 H2 Class Atlantic 4-4-2 No. 32424 ‘Beachy Head’ in BR black livery with early emblem. Also on display were the EPs of the ex SECR Birdcage Stock that have been seen for a while now. TMC announced a number of wagon commissions, via Bachmann one of which being one of the 14 Cycle branded PMVs which were introduced in 1952, primarily for use on boat trains, being essentially a modification of ex SR Parcels and Miscellaneous Vans to incorporate hooks inside to hang cycles. Numbers so converted were 1055,1103,1208,1728, these had 60 hooks presumably for up to 30 cycles, whilst 1057, 1113, 1175, 1282, 1293, 1305, 1314, 1317, 1454, 1882 had 24 hooks each. Number 1317 in addition to the bike symbols on the outside was additionally stenciled, until 1966, for use between Ashford and Cannon Street to convey cycles by manufacturer Normans of Ashford. These vans, except numbers 1175 & 1208 withdrawn in December 1962, had all returned to the general pool by 1969. The version being issued by TMC is number S1282S correctly in BR crimson livery with yellow lettering and the white cycle stencil. There were no new announcements made by Dapol at the show in either 00 or N, as they are looking to get to market all outstanding products currently under development before making any new announcements. The ex London and South Western (LSWR ) B4 0-4-0T announced back in March 2014 is still at the CAD stage. They did have on show some of the results of the alignment of the Dapol and Lionheart ranges in 0 Gauge but none of these were SR related. Likewise no new announcements but the Kernow Model Rail Centre has on disaply their EP samples of the PBA/JIA clay tigers, the ex LSWR Gatestock as featured last week on my post here, and also, although GWR origin, the delightful diminutive 1361 class 0-06-0T saddle tanks with all the correct detail variations that they are producing. Back in January this year Heljan announced their intention to release an 07 Class 0-6-0 Ruston & Hornsby Diesel Shunter numbers D2985-D2998 (TOPS numbers 07001-07014). Introduced in 1962 this class of 14 locomotives was designed specifically for use in the Southampton Docks complex on trip and shunting duties. With the decline of traffic within the docks the class was re-assigned to duties in the Eastleigh area before withdrawal and finding further work with a number of industrial companies. Proposed for release in 2017, Heljan had a early 3D print mock ups of this model on display.